Location is Ratina stadium, in center of Tampere. Address is Ratinan rantatie 1, Tampere, and there room Balet 3 (balettisali 3). Dates are 6., 13., 20. and 27.6.2012. 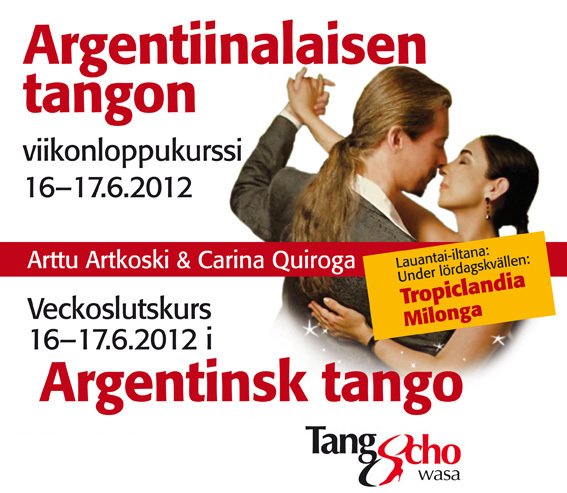 You are so welcome to learn tango with us! This summer we are again on tour with our friends at DNI Tango. This summer we go for the first time to Vaasa. Tangocho invited us to give a weekend seminar in June.